Oct 2009, Beijing China—After the perfect 2008 domestic performance tour and 2009 Europe performance tour, Li Biao’s Percussion Group will be invited by NCPA (the National Center for the Performance Arts) again to bring us a fantastic concert on Oct.4, celebrating the 60th birthday of China. As the top percussionist in Asia, Prof. Li will inspire the passion and enthusiasm of Chinese people for the percussion music this National Holiday. Li Biao, professor in Central Conservatory of Music and Berlin Academy of Music, is the first Chinese percussion musician to win an international prize. He has performed in over 70 countries throughout the world. For his skillful techniques, special understanding on solo music and unique performance style, he is praised as one of the most outstanding percussion soloists among the few musicians of such kind music circle in the world. Besides, this concert will also be staged continually in Yantai (Oct 5), Tsingdao (Oct 6), Guangzhou (Oct 7), Shenzhen (Oct 9), Shanghai (Oct 9), Suzhou (Oct 11), which is a really great feast for the audience. In the recent international music scene Li Biao is one of the few outstanding solo percussionists. His astonishing technique and profound understanding of the percussion instruments as well as his extraordinary musicality have earned him this high reputation. Born in Nanjing, China, he began his musical studies at the age of five and soon was discovered as one of the most talented children in China. At the age of seven, Li already performed as soloist representing China in many countries. He attended the China Conservatory of Music in the year 1982. Upon graduation in 1988, Li was chosen by the Chinese government to be one of the first percussionists to study in Moscow at the Tchaikovsky Conservatory with V. Sniegerew and graduated with a master degree of first honor. Li continued his music education in Germany after winning the DAAD scholarship. Between 1995 and 1998 he studied at the Munich Conservatory of Music with Peter Sadlo and graduated with a Master class Diploma. During his studies Li won many international prestige competitions including the Debrecen Percussion Competition 1993 and the Alimata Music Competition, he was the first Chinese to win the international percussion competition. As a soloist, Li has performed various music pieces from different periods. He has also inspired many accomplished composers to write solo percussion works to emphasize his unique style. All these pieces have been performed during a specific tour with tremendous success. Li masters more than 50 to 60 different kinds of percussion instruments which come from Africa, America, Europe and Asia. Li Biao gave many solo recitals during music Festivals such as: the Schleswig-Holstein Music Festival, Sommerkonzert zwischen Donau und Altmuehl, Festival der Nationen, Fuji Music Festival and Bela Bartok Festival, Bad Kissingen Music Festival，Music Biennale Zagreb,Night of percussion in berlin philharmonic, Music Viva. As Soloist he also appeared with renowned orchestras and chamber ensembles such as: Bavarian Radio Symphony Orchestra, China Philharmonic Orchestra, London Brass and many others around world. Following an invitation of the Philharmonia of the Nations as Soloist on the 1999 & 2000 Davidoff Friendship Tour in Europe and Asia, further tours led him as Soloist with the Beijing Symphony Orchestra in 2001, 2003 and 2006，2009 through Europe. Li Biao recorded percussion works as Solo, Duo, and Chamber Music for Label as “EMI” "Teldec", DW. His solo concerts had also been broadcasted by the TV and Radio Stations that include: ZDF, BR, CCTV, etc. In 2003, Li Biao was invited to teach at Beijing Central Conservatory of Music as professor. In 2006, became a professor of the Hochschule fuer Musik“Hanns-Eisler” in Berlin, one of the most prestigious music institutes in the world. In March 2008, he received the "National Spirit Achiever Award" from Mercedes Benz. In 2008, Li Biao and his Percussion Group were invited to perform at the closing ceremony of the 2008 Beijing Olympic Games, and recorded all the percussion music for the closing ceremony. Li Biao is the endorser for the following Instrument company: Sabian, Vic firth, Evans, DJ. 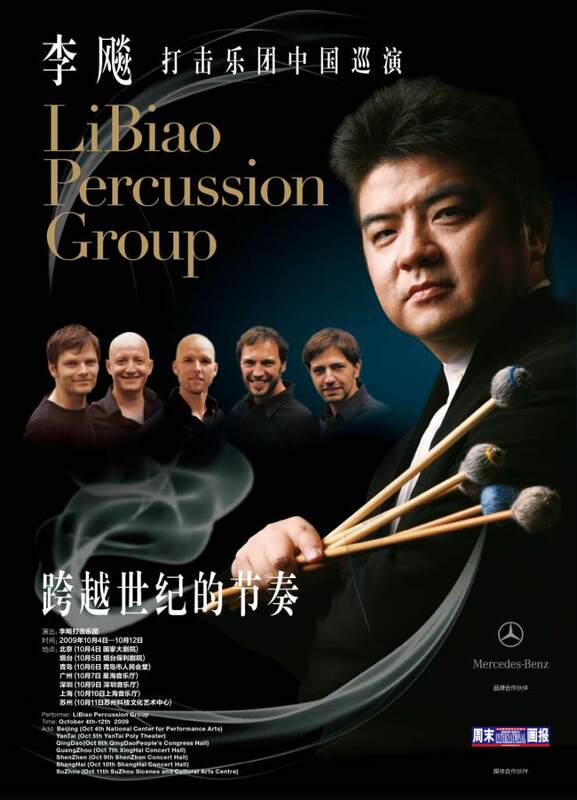 Li Biao Percussion Group was founded in 2005 with orchestra members coming from all over the world. As one of the top percussion groups, they have performed during various renowned music festivals and music activities, inspiring lots of accomplished composers to write percussion works of which the music style covering mainland, classic, Jazz, modern and pop and the instruments commanded will weigh over 5 tons and surpass 100 pieces, all of which make this concert a big hit to the eyes and ears of the audience. In 2008, Li Biao and his Percussion Group were invited to perform at the closing ceremony of the 2008 Beijing Olympic Games and recorded all the percussion music for the closing ceremony. European news papers used to describe the performance as a comprehensive voyage of the world music.